Some jobs require exceptional power. 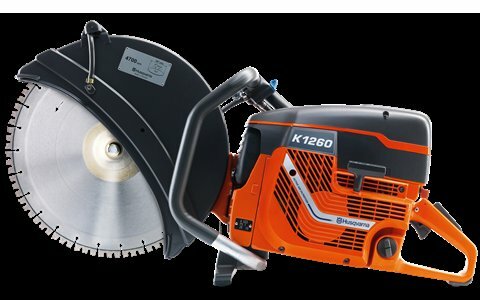 The K 1260 is a real powerhouse with an impressive 5.8 kW output, turning your heaviest cutting job into a fast and effective operation. Suitable for road works when used with the corresponding KV 970 trolley. The trolley also means you can fully concentrate on the cutting job. Reduced wear thanks to the drive belt with fully sealed transmission, which keeps out the cutting dust. Our built-in automatic filter compensation SmartCarb™ maintains high power and lowers fuel consumption. Reduced vibrations in the cutter handle for more comfort and longer operation periods. EasyStart ensures easier starting by reducing the compression in the cylinder. Our built-in automatic filter compensation maintains high power during the air filter life time. Our two-step filtration system with centrifugal cleaning and a single paper filter increases product life and extends service intervals.